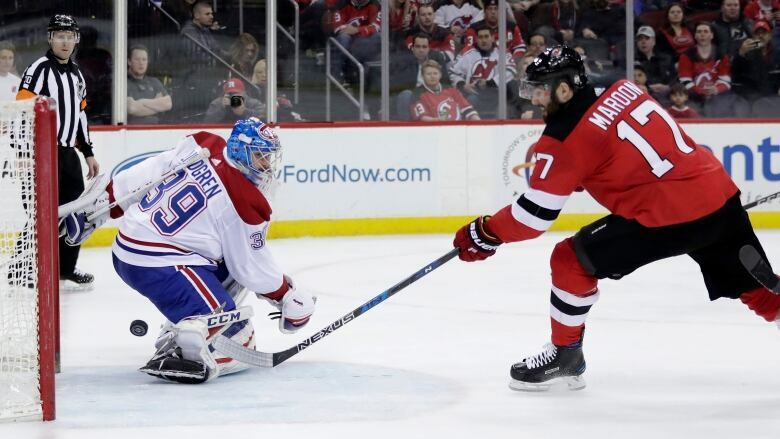 Taylor Hall extended his unofficial point-scoring streak to 26 games, Travis Zajac scored two power-play goals and the New Jersey Devils snapped a three-game skid with a 6-4 win over the Montreal Canadiens on Tuesday night. There's no stopping Taylor Hall, unquestionably the New Jersey Devils' most valuable player in their quest to end a five-year playoff drought. Hall's consecutive-points streak is the longest in the NHL this season. Hall, who had two assists, has recorded points in his last 26 appearances dating to Jan. 2. He missed three games before the All-Star break with a thumb injury during that span. "It's cool. It seems like everything is kind of bouncing the right way when I'm out there, especially on the power play lately," Hall said. "So it's great to chip in, great to contribute, and I'm out there to get points, score goals and play well that way, so I want to keep it going. At the end of the day, I just want to be on a team that gets into the playoffs." Stefan Noesen, Blake Coleman, Patrick Maroon and Brian Boyle also scored for the Devils. Keith Kinkaid made 29 saves as New Jersey solidified its grip on the first wild-card slot in the Eastern Conference. Noesen got the Devils rolling, deflecting Will Butcher's point shot past Charlie Lindgren at 8:25. New Jersey then broke it open with three goals in a span of 3:15 late in the period. Butcher, back on ice after a brief locker-room visit for medical attention after suffering a facial cut, played a hand in New Jersey's second tally with 3:27 remaining in the period. Lindgren stopped Butcher's initial shot, only to have Coleman steer home the rebound. Zajac polished off the first period with his tallies. Kyle Palmieri fired a shot from the left circle that Zajac tipped in with 1:52 left. Hall got the point that extended the streak with 12 seconds remaining when Zajac slammed home his rebound. "He's been on a mission and he's been our best player all year," Zajac said of Hall. "He's brought momentum over these last 26 games for us, and he's grown as a leader. It's great to see." Gallagher cut the Devils' lead to 4-1 midway through the second period. Maroon scored his first goal as a Devil about a minute later. He has points in all four games since coming to New Jersey in a trade with Edmonton. It was New Jersey's third power-play goal of the game with Hall assisting. "In the four games I've played here, he's been by far one of our best players, and that's exciting to see, especially in meaningful games like this," Maroon said of Hall. "Big time players step up." De la Rose tallied again in the third, trimming New Jersey's lead to 6-3 with 5:20 remaining. Froese closed out the scoring in the final minute.